The plan was to sleep in and do a short relaxed day today. 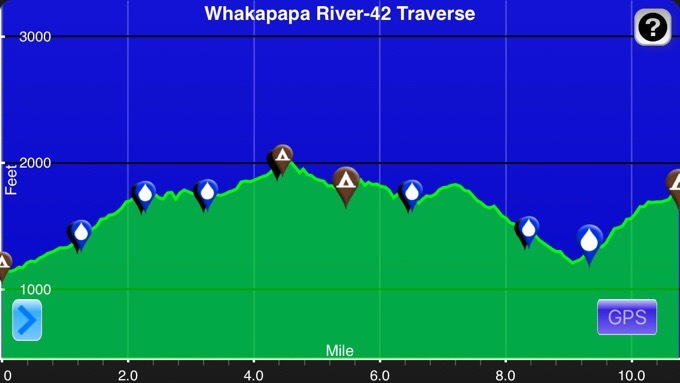 Due to weather and logistical timing, we need to go slow to hit the Tongariro Crossing on a projected fair weather day. We could have zeroed in town and done bigger days, but it was more appealing to get going and do a nice relaxing stretch before the Crossing while weather moved through. Speaking of weather moving through, the rain started around 4:30am, and it was one of those dreary, cold, and steady rains that you want to stay in bed all day and avoid. We all silently laid in our tents wishfully hoping it would magically stop. I posted the blog and watched a bit of Bloodline. Around 8:30am, I looked up the weather, and it was clear that the rain wasn’t going to stop. I told the group and we all reluctantly packed up at our own speeds. First out were Matt and Laurel. Becky and I weren’t far behind and we left at 10am. As we were leaving, Angelynn arrived. She needs to be in Wellington by a certain date, so she will have to do the canoe at an earlier date than us. 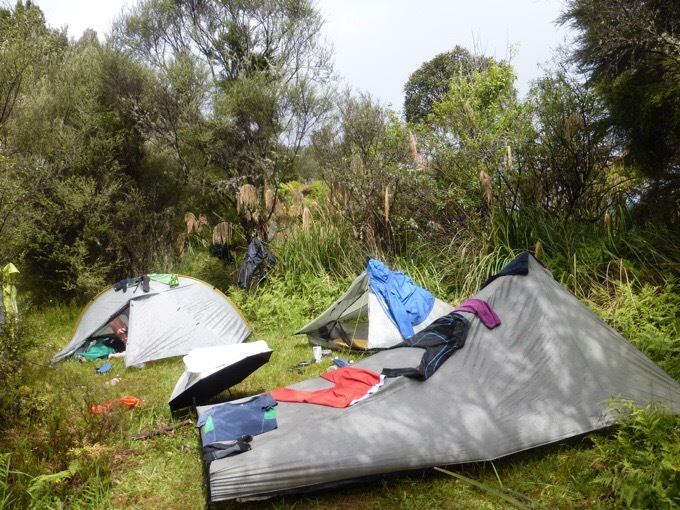 She made a last minute decision to give the Tongariro Crossing another try yesterday. It ended up working out and she said it was awesome and definitely worth waiting to get a clear day to go through. She, Heartbreaker, Vittoria, and Tom were not far behind us after we left. 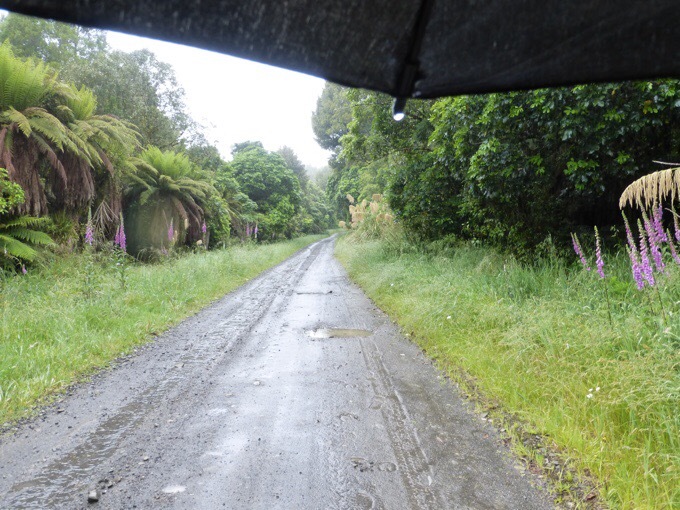 It was a cold wet hike on a very mundane four wheel drive road. I was very happy that we weren’t going through brush! 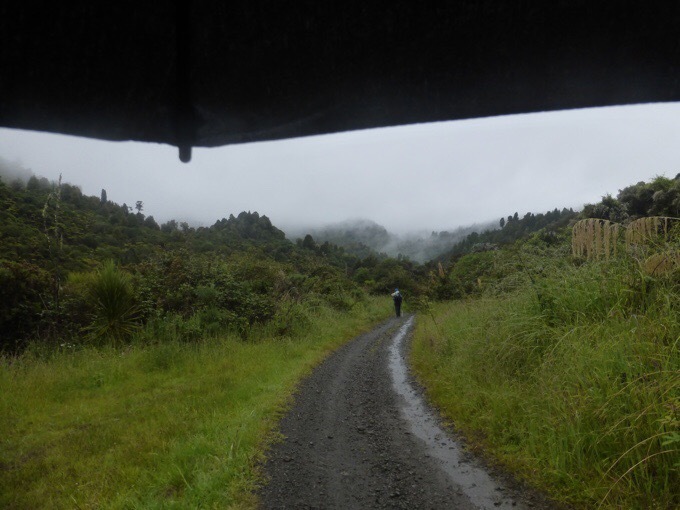 The rain had moments that it let up, but we ended up hiking about four hours before it stopped for good. The plan was to hike about five hours, but when it stopped, we weren’t sure if it would return, and since we don’t have far to go tomorrow, Becky and I jumped at the opportunity to pitch our tents when we found a decent spot with plenty of space. It was only four hours of hiking, but with everything being so cold and wet, we were plenty done with this day. Once we setup, the rest of the crew trickled in and we all discussed the idea of doing the Crossing even a day later than the already relaxed schedule we have. The weather looks significantly better for Saturday rather than Friday. Friday is clear, but major gale force winds and below freezing wind chill. 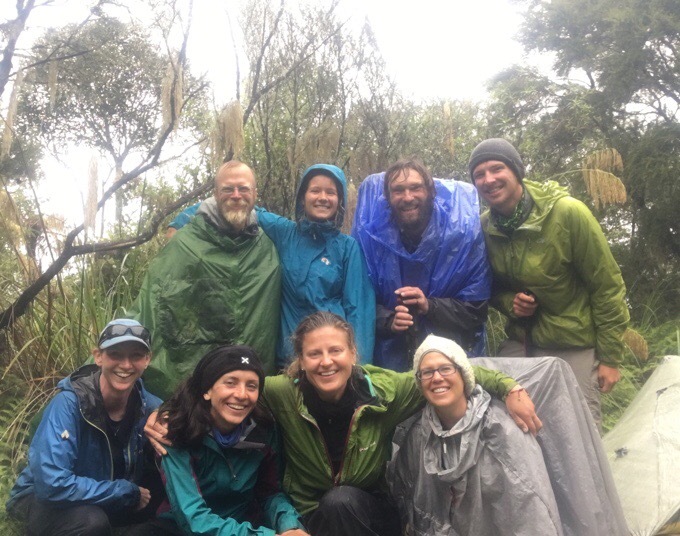 We also found out today that there is a Swiss tourist couple missing that set off to do the Tongariro Crossing the same day that Becky and I hitched there and decided not to do it, and also Angelynn and Heartbreaker hiked in a bit and chose to turn back. It really can get dangerous up there quick, and if we need to eat some time to give us more ideal conditions, we think it’s worth it. We calculated that we still have enough room in the schedule to do it Saturday and make it for our boat launch date on Tuesday. I’m sure this is all confusing for those at home, but basically what is happening is that we all are doing really short days right now to inch towards the Crossing and stretch it out so that we will be there for clear weather. It will give us a couple bigger days after the Crossing, but totally doable. So we may actually get a good day for the Tongariro and all this effort to time it right may be worth it! Everyone will be making their own strategy, and some still want to be in position to do Friday if winds magically die down at the last minute. Tom chose to stay at the camp with us, while the rest of the group chose to hike a bit more today since it was still early and the rain had stopped. We said goodbye to Angelynn, who we might not see again now that she has to move on ahead to meet a friend in Wellington. We got a group photo of everyone with their rain gear on before they left. Matt/Softwalker, Becky, Heartbreaker, Tom, me, Vittoria, Angelynn, and Laurel. So, from around 3pm on, it was just relaxing in our tents with Tom. 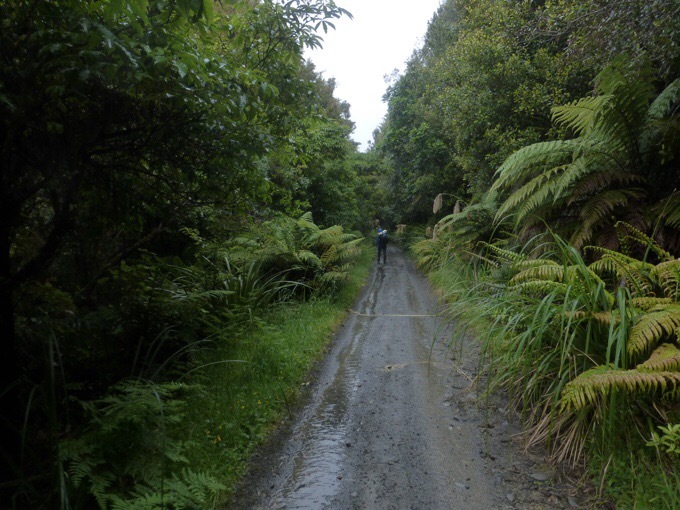 We first overlapped with Tom, a 23yr old Aucklander, when we were walking out of Te Kuiti. He cheerfully introduced himself as we crossed path and has a welcoming light spirit. 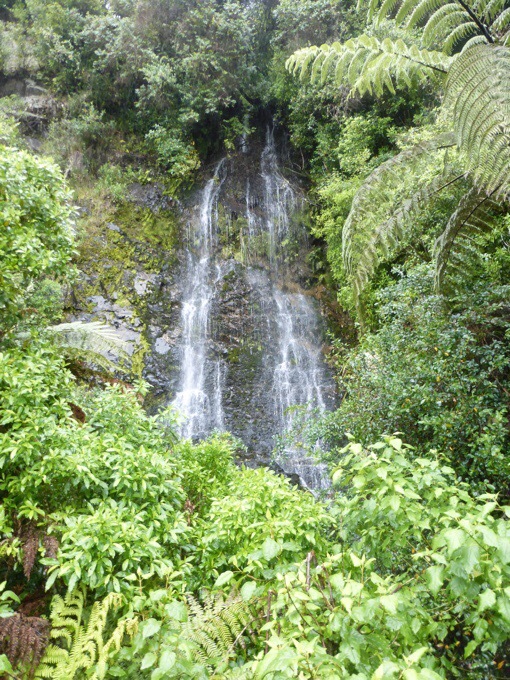 We leapfrogged a bit from Te Kuiti to Taumarunui, and all stayed at the Holiday Park in Taumarunui at the same time. Now, he’s part of the large group that are all doing the canoe launch the same day as us. It is Tom’s first long hike, and he did a great job of researching and buying the lighter gear from the US cottage companies. He is keeping a casual blog that is updated about once a week for family and friends that is coincidentally enough called Walk With Ward, ha! His last name is Waardenburg. It amazes me how quickly time can pass in camp. The sun actually came out and we got to dry things out some, so that was nice. Becky’s still fighting off the cold a bit and that dang pack that’s too small for her was really bothering her back today and yesterday. Thankfully, it doesn’t leave lasting pain and it’s only when she’s wearing it. She has just a handful of days left with it before we get to the canoes. Then the new pack that should fit correctly is waiting for her when we row into the town of Whanganui the day before Christmas. Perfect timing! Fingers crossed for good weather for the Tongarigo Crossing! Hope it´ll work out for you all. I was wondering … is it Gatewood Cape that Matt/Softwalker has as a poncho (and tarp)? It’s similar, but is the one made by Six Moon Designs. Hi – can you please check the URL for Toms blog? Sorry about that! I just fixed the link. Thanks for letting me know. You all have quite the drying fest going on. Even your umbrella works good for that! Hope your crossing goes well.